We discuss your brand identity to deliver custom websites. Across the internet and social media, stay visible. Get your FREE SEO Report within minutes! Don't know why your website isn’t ranking on Google? Find out with Supple's FREE Website Audit Tool. Get an instant report emailed to you with actionable insights for getting more customers. FREE DIY SEO Audit Tool for Business Owners. Price FREE. We give you a PDF report. Enter your email to receive your free SEO audit delivered straight to your inbox! Look through the report to gain actionable insights and valuable recommendations on how to boost your business using SEO. Why do you need an SEO audit in 2018? SEO is critical for being found by potential customers on Google. An SEO audit helps you determine how your website's SEO is performing, and gives you the insights required to improve your ranking on Google. An SEO audit ensures that you become aware of SEO issues before they impact your users or Google ranking. This allows you to make preemptive moves to ensure your ranking does not suffer. An SEO audit also gives you the insights necessary to improve your website's SEO and performance. You might, for example, become aware of your website's slow loading time or insufficient on-page content, giving you an idea of how you may improve. Manually testing your SEO can be incredibly time-consuming and requires an in-depth understanding of SEO. An SEO audit, on the other hand, generates all the information you require in just a few minutes, meaning the only thing you need to do is read through the report! Our crawlers can identify technical SEO issues that the Average Joe couldn't spot, giving you the information you need to fix these complex issues. An SEO audit also cuts out all the fussing around, giving you immediate feedback on what is holding you site back in search results. No lengthy meetings with SEO agencies before the data is ready or overly complicated analytics - just the cold hard facts! What will be included in my SEO Report? This free SEO report is ideal for gaining an overall look at your website's SEO performance. However, it can only scratch the surface of the entire auditing process. The free SEO audit tool can only provide a limited look, as we don't have access to your website's Analytics, Search Console, Server Logs' data and more. Can I look at a sample SEO Audit Report? The best sample report is the real thing - it seriously only takes a few minutes to generate a detailed, free SEO report after you enter your website URL. Don’t have a few minutes to spare waiting? Don’t worry, our SEO audit tool is email automated – so we can email you your free SEO report as soon as it’s ready. Do you have an SEO Audit Checklist? The team at Supple do have a specialist SEO Site Audit Checklist we go through when doing a full SEO site audit - however, it is just for our team, so the only way to access it would be to come work for our SEO agency 😉. This isn’t us being greedy with our tricks of the trade. Seeing as digital marketing is a fast-changing industry and search engines constantly update their ranking algorithms, our Audit Checklist is constantly being updated and fine-tuned by our team. So, it’d be a bad idea for us to offer it out as a PDF - some of the things on there could become outdated in a week’s time! A mortal sin for any SEO agency to declare as “current & accurate”! Supple is an award winning digital marketing agency that begun as an SEO agency, but has now expanded to offer various digital marketing services in Sydney and Melbourne. This includes SEO, Adwords management, Facebook advertising and custom built websites, to name just a few!. We were named as one of Australia’s fastest growing companies in the Financial Review’s Fast 100 for 2017 and Deloitte’s Technology Fast 50, we’re one of the few Google Partner-certified agencies based in both Melbourne & Sydney. We’re also one of the few Australian SEO agencies committed to empowering small business owners with their own digital marketing through our range of great, free tools. Beyond this free SEO audit tool, we provide a Facebook Messenger Chat Widget Tool for your site, a review link generator to take people straight to your Google Reviews page, a technical SEO tool to check the persistent connection status of your website and many more! 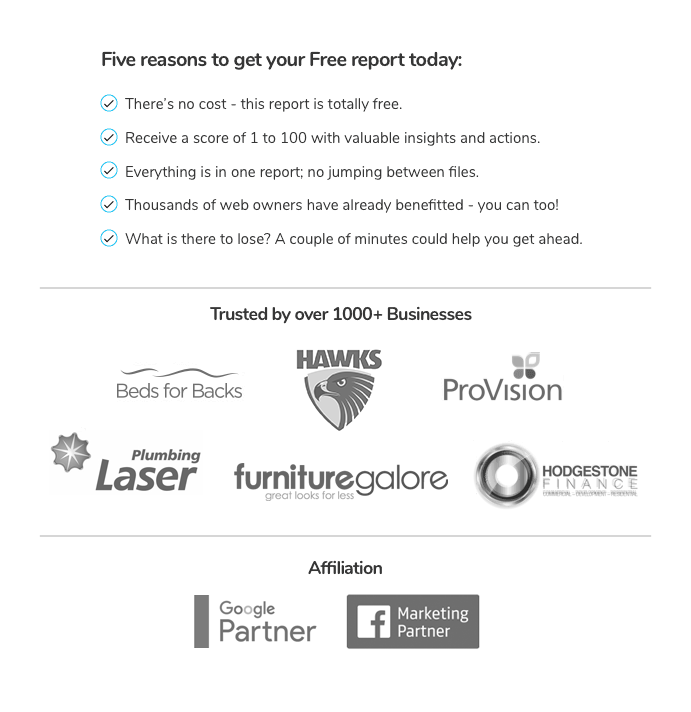 Got questions about our free SEO audit tool, our full SEO audits or any of our other services? Contact our team on 1300 Supple or have a chat to us online!